Oh No, Not Another Opinion on Jeremy Lin! You don’t have to be a professional basketball fan to recognize the name Jeremy Lin. But in case you don’t, let me introduce you. Jeremy Lin is a point guard for the New York Knicks, a team that has won its share of championships, but in recent years one of the more mediocre teams in the National Basketball Association. In the last two weeks however, they have created a firestorm of excitement because of Lin. Before a loss on Saturday night, they had won seven games in a row. The winning streak coincided with the insertion of Lin into the starting lineup. I make this entry with a certain measure of trepidation, knowing that it will not present any new information. So much has been written about Lin that if you Google the name you come up with nearly 600,000 articles in less than a second. Even publications that aren’t known for sports coverage are caught up in “Lin-sanity”. (All right, I’ve written the obligatory pun that is most associated with this phenomenon.) Sojourners magazine online, for example, can’t seem to write enough about Lin. What more can be said? So this blog entry contains merely personal impressions with few, if any, amazing insights. Several factors make Jeremy Lin special, not the least of which are his intelligence and ethnicity. 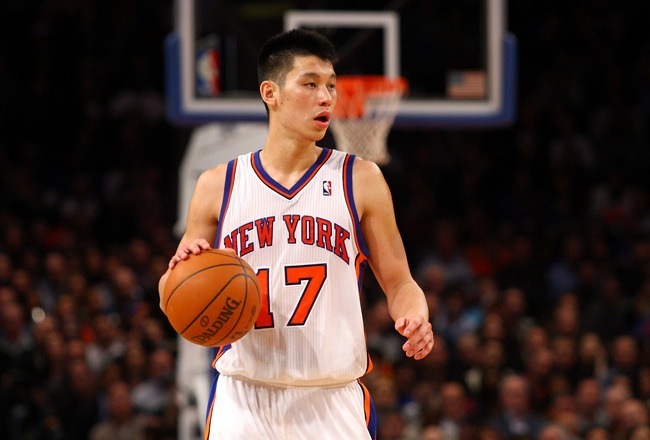 The son of Taiwanese immigrants, Lin is a Harvard educated, second generation Asian-American that plays in the NBA. The league is not noted for its immense number of players in either category. But besides breaking a long-held stereotype that Asians can’t excel in a sport dominated almost exclusively by African-Americans, Lin also possesses other characteristics that set him apart: determination, humility and faith. Despite leading his high school to the California state championship, he received no athletic scholarship offers. So he chose to attend Harvard, where he majored in economics and graduated with a degree in economics and a 3.1 grade point average. Despite his college success, he went undrafted by any professional team; and after trying out for several teams, Lin received a contract with his hometown Golden State Warriors. The Warriors ended up cutting him, as did the Houston Rockets. The Knicks signed him in late December but he was told not to get an apartment because his stay might not be long with them either. We now know that won’t be the case. Lin’s ambition however, was not to play in the NBA, but rather to become a youth minister. Thanks to his college coach, former Duke standout Tommy Amaker, Lin’s career path may have taken a totally different turn. And this is what makes this story so inspiring. Lin makes no apologies for his faith. Neither will he hide it. He will share his witness with anyone. And that inevitably leads one to make immediate comparisons with Denver Broncos’ quarterback Tim Tebow. Here’s where I think they differ. Lin has had nowhere near the fame and publicity that preceded Tebow’s entry into the NFL. And whereas Tebow has had to prove that his skills make him worthy to compete on a professional level; Lin’s performance to date casts no such doubt on his ability. The challenge Lin faces is not his ability to succeed – he has apparently done that at every level – but his success must serve to overcome the deeply held ideas about athleticism that are inextricably intertwined with race. In other words, demystify the old “White men can’t jump” syndrome. Obviously the more attention Lin receives, the greater his forum for Christian witness. Yet undoubtedly there is an element of incongruity in equating faith with success, as columnist David Brooks so articulately points out in an op-ed piece in The New York Times. It borders on what Martin Luther called the theology of glory. And while great care should be taken to guard against it, it is nevertheless refreshing to watch Lin. I like to think of him as an infusion of spirit into the NBA’s valley of dry bones, to use another biblical image. So for a few more moment, or another couple of weeks, or however long this spectacle lasts, let’s go along for the ride.